PHOENIX (AP) In his second NBA game, Lonzo Ball earned his first victory and almost got a triple-double to boot. Ball, the No. 2 overall draft pick who doesn’t turn 20 until next Friday, had 29 points, 11 rebounds and nine assists in the Los Angeles Lakers’ 132-130 victory over the Phoenix Suns on Friday night. So he took 27 shots and made 12, finishing 4 of 9 on 3-pointers to go with his cache of assists and rebounds. Ball’s career high in college was 24 points during his lone season at UCLA. Ball took over down the stretch, scoring eight points in a 2 1/2-minute span. His final basket during that run, a floating layup, put Los Angeles ahead 130-122 with 1:35 to play. Veteran Phoenix center Tyson Chandler was impressed. But the Suns came roaring back behind Eric Bledsoe and Devin Booker, who sank a 3-pointer with 6.4 seconds left to cut it to 131-130. Brandon Ingram made one of two free throws to give Phoenix one last chance, and Warren was fouled by Ingram on an inbounds play. The free throw was off the back of the rim, though, and the Lakers held on. Bledsoe scored 29 points, 17 in the fourth quarter. Booker also flirted with what would have been his first career triple-double, finishing with 25 points, 11 rebounds and eight assists. Warren added 24 points, 17 in the second quarter. Ingram scored 25 points for Los Angeles. Both teams were coming off season-opening blowout losses. From the opening tip Friday, it was a fast-paced, often sloppy game with not much attention to defense. Booker was called for a flagrant one when he fouled Brewer hard on a layup with 6:02 left in the third quarter. Larry Nance Jr. jumped into the fray and put a shoulder into Booker, who responded with a shove. Booker and Nance both were assessed technical fouls. 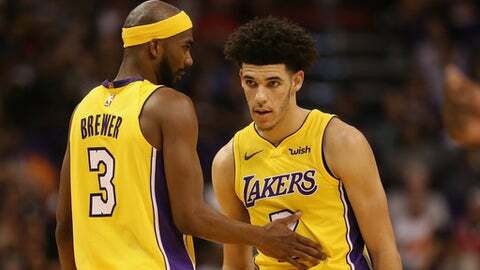 The play came during a 13-2 Lakers outburst that put Los Angeles on top 95-85 after Nance stole the ball from Booker with both players on the floor and flipped the ball to Brook Lopez for a layup with 3:03 to play in the third quarter. The Lakers boosted the lead to 111-99 on Jordan Clarkson’s basket with 10:28 to go. Lakers: Luol Deng, who started Thursday’s opener, was inactive. … Ball had three points, nine assists and four steals in his debut Thursday night against the Clippers. … The Lakers locked arms as they stood for the national anthem. Suns: In the second quarter, Warren was 6 for 7 from the field and 5 for 6 from the foul line. … Booker was flattened under the Phoenix basket by Lopez in the second quarter. Booker was slow to get up but stayed in the game. Lakers: Host New Orleans on Sunday night. Suns: At the Los Angeles Clippers on Saturday night.